The Canon PowerShot A650 IS is a 12 megapixel image sense with a 6x optical zoom lens (35 – 210mm), image stabilization and a 2.5 inch vari-angle LCD. It features an ISO range of 80 – 1600 (with up to 3200 expandable). The camera measures 4.41 x 2.67 x 2.21 in. (112.1 x 67.8 x 56.2mm) and weighs 10.58 oz. (300g). The Canon PowerShot A650 IS will have a retail price of $250 USD when it ships in September. Canon U.S.A., Inc. today announced two new PowerShot A-Series digital cameras, including one with the highest resolution in the series to-date – the show-stopping 12.1-megapixel PowerShot A650 IS digital camera – and the powerful 8.0-megapixel PowerShot A720 IS digital camera. These new cameras continue the promise of the PowerShot A-Series by delivering superior image quality at a great price. Both cameras maintain many of the features of this ultra-successful line, with improvements to better meet the needs of users who want a solid and smart point-and-shoot with user-friendly manual capabilities. So, whether it’s an experienced enthusiast looking for a full feature-set and lots of imaging benefits, or a casual, or even first-time user looking for an easy-to-master point-and-shoot, the Canon PowerShot A650 IS and A720 IS digital cameras will more than satisfy. These cameras, with a comfortable shape and design that features a grip for a natural fit and stable handling, are great for outdoor enthusiasts needing to capture that special moment when they reach the top of the mountain or trek through the rainforest. “By enhancing the PowerShot A650 IS and A720 IS digital cameras with advanced, yet user-friendly feature-sets, at a reduced price point, the A-series will continue to stand-out from the competition,” said Yuichi Ishizuka, senior vice president and general manager, Consumer Imaging Group, Canon U.S.A. The PowerShot A650 IS digital camera is designed for photo enthusiasts who demand superior image quality, and are looking for a versatile camera with exceptional creative control. The PowerShot A650 IS Digital Camera has breathtaking 12.1-megapixel resolution and a generous 6x optical zoom with optical image stabilization (OIS) that ensures steady shooting every time. A variety of enhanced controls, such as 21 shooting modes including Kids & Pets, Manual, Aperture-Priority and Shutter-Priority, among others, will also give users a lot of freedom to make the camera adapt to their specific needs. All of this power is easily navigated via the intuitive mode dial, easily viewed via the 2.5-inch Vari-Angle LCD and just as easily handled, via the ergonomic grip. With these targeted features, users can spend more time actually taking photos, rather than trying to figure out how to take them. The PowerShot A720 IS digital camera is designed to make capturing and preserving memories fast, fun and easy for Moms and Dads on-the-go with their busy, growing families. The upgraded 8.0-megapixel resolution and Canon’s Optical Image Stabilization technology ensure that images are sharp and clear in almost every situation – even those prone to image blur caused by camera shake. The PowerShot A720 IS camera is also capable of recording high-quality VGA movies, making it perfect for capturing memories in motion. The new camera has a wide array of creative shooting modes, a simple control layout for super-easy operability and an ergonomically correct grip to ensure a comfortable fit. Both of the new A-series cameras are also built for fun in the sun and sea. Snap the PowerShot A650 IS into Waterproof Case WP-DC18 or the PowerShot A720 IS into Waterproof Case WP-DC 16 and they become both weatherproof and waterproof at depths up to 130 feet, making them great accessories for the beach, water-park or a scuba trip. Both cameras are part of Canon’s “A-Team” (powered by AA batteries), so powering up will be quick and easy. Setting them apart from competitive models, the PowerShot A650 IS digital camera and the PowerShot A720 IS digital camera give consumers interested in the ease of a point-and-shoot camera many of the technological advancements that are the result of Canon’s 70-year heritage as an imaging innovator. With Canon’s new Genuine Face Detection technology, the camera can detect up to nine forward-looking human faces in a scene. The Face Detection algorithm automatically prioritizes and selects faces and not simply the closet object (based on Canon’s Intelligent Scene Analysis/iSAPS technology). It will then optimize the focus, exposure and flash to ensure the best possible results. Using Canon’s Face Detection, photographers can keep up to nine faces in focus at any one time no matter where they are within the image. Working in concert with Face Detection, the “Red-Eye Correction” feature helps to detect and correct red-eye during playback mode. Images can be corrected automatically or manually while viewing photos on the LCD screen. Canon’s new Face Detection Technology makes for even easier picture-taking moments, helping users ensure in-focus smiles, and assist in the elimination of over-exposed faces. The extended zoom range of these cameras makes optical image stabilization (OIS) essential. Canon’s lens shift OIS provides an effective antidote to camera shake, particularly at longer zoom lengths or during long exposures when even the slightest hand-held shake is magnified to picture-blurring proportions. Superior to electronic image stabilization systems that simply use software to mask movement, OIS actually shifts the lens proportionately to compensate for unwanted motion, making it easier to snap great images. The OIS found in Canon PowerShot digital cameras is based on technology developed for Canon’s renowned high-end professional EOS SLR cameras. The estimated selling prices of the PowerShot A650 IS digital camera and the PowerShot A720 IS digital camera models are $399.99* and $249.99*, respectively. Both models are scheduled to be available in stores in September. 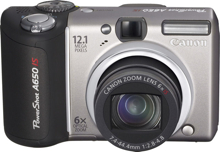 The Canon PowerShot A650 IS camera kit includes four AA batteries, 32MB SD memory card, USB interface cable, AV cable, wrist strap and Canon’s software suite. The Canon PowerShot A720 IS camera kit includes two AA batteries, 16MB SD memory card, USB interface cable, AV cable, wrist strap and Canon’s software suite.